Preheat the oven to 350°F with the rack in the middle. Line a baking sheets with parchment paper. Whisk the flour, cocoa, baking soda and salt in a medium bowl. In another large bowl, beat the butter with a stand mixer or a hand mixer at medium speed until it is light and fluffy, Add the sugar and beat until the mixture is light and pale.Beat in the eggs, one by one, incorporating one completely before adding another. Beat in the espresso.Switch the mixer speed to low and mix in the dry ingredients, beating only until incorporated. 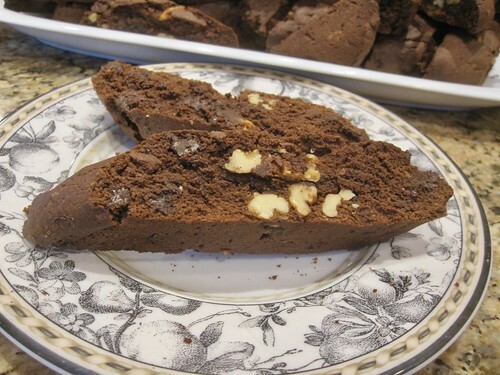 Don’t overwork the dough.Stir in the chopped chocolate and nuts with a sturdy rubber spatula. Using moistened hands, halve the dough and form 2 (15-by 2-inch) loaves on an the baking sheet, spacing the logs 3 inches apart. (I roll the dough gently with my hands to get an elongated rope and then shaped it, gently stretching and flattening into logs. )Bake in the preheated oven until it is mostly firm to the touch, about 25 mins.Take the sheet out of the oven and cut the logs crosswise with a sharp serrated knife into 1/2-inch slices. Place the slices on the second baking sheet, cut side down. Bake until firm and crisp, about 5 mins on each side.Transfer the cookies to a rack and cool.